Senior Editor’s note: I was hoping we might have a genuine controversy, rather than Kevin looking for a replacement for Fester and more inane shouting matches. For those of you who notice, the article Kevin uses is Israeli as though they, for some reason, were trying to let Erdogan off the hook. I can only think of one reason for that and not the one Kevin is selling. Kevin calling Turkey under Islamist Erdogan democratic is patently offensive. Maybe Kevin can’t see 12,000 ISIS trucks either or believes tens of thousands of terrorists move easily through Turkey because it is such an informal place. I have been there too and not on a government financed vacation. Kevin also misses the ethnic cleansing of the Kurds. How can the leader of a democracy kill so many reporters and arrest or fine anyone who criticizes him? helped pen the lawsuit against Erdogan for his personal involvement in stealing 38 manufacturing plants from Aleppo. As for Kevin’s claim that, because someone was an attache to Israel they are an Israeli spy we might note that Jim Hanke, Kevin’s fellow editor, was an attache to Israel and is hardly a fan of Zionism. What Kevin fails to realize is that an attache is tasked, primarily, with spying. Hanke carried covert nuclear detection equipment into Dimona as attache. The rest of this is an attempt to “dazzle” with political pseudo-expertise best left to Gwyneth Todd, who is a real expert on Turkish politics. Calling Turkey under Erdogan democratic or anything other than a terror state, based on massive evidence presented daily on VT, is an offense against nature. Erdogan has had years to stand up to Israel “once.” There are thousands of Turkish troops operating inside Syria helping the people there enjoy the fruits of self determination before killing them. Much of this article is simply meaningless and I am disappointed. Is anybody out there surprised that Israel was behind the coup attempt in Turkey? People hypnotized by the anti-Erdogan propaganda flooding the alternative media … people with zero knowledge of recent Turkish history, and/or zero sympathy for majority of the Turkish people’s aspirations for a more democratic, Islamic, powerful, and genuinely independent country … such people might well be surprised. It was obvious to those of us with a basic understanding of who’s who in Turkish politics. People like my VT colleague Ian Greenhalgh seem not to know that Erdogan’s political enemies in Turkey are far more pro-Zionist than Erdogan himself is. This is “Turkish Studies 101” stuff. 2. The Zio-Kemalist Deep State (ZKDS). These are the people who have been running the country, from their base at the top levels of the Turkish Army, since the Rothschild-sponsored Donmeh Jew Attaturk culturally genocided the nation in the 1920s. The ZKDS is closely tied to Israel and the Operation Gladio side of NATO. They run the Turkish heroin industry. They are the neocon “Turkish-American Council” that Sibel Edmonds revealed helped stage 9/11. Historically, whenever Turkish democracy starts to blossom, and Turks elect pro-democracy Muslims, the ZKDS stages a brutal coup and imprisons and/or murders the pro-democracy leaders. The last several coup attempts, however, have failed, due to adroit maneuvering by the AKP and its actual and provisional allies. 3. Fetullah Gulen (FG). Gulen is classic “controlled opposition.” He is a pure creature of Mossad-CIA. He poses as an Islamist in order to divide-and-conquer the Turkish Islamic democracy movement. In fact, he is an agent of Israel. So when Erdogan accuses Gulen of being behind the coup attempt, he is in fact accusing Israel. 4. The honest, principled democratic Islamists (HPDI). Unfortunately, this species is always on the verge of extinction, since it is ruthlessly hunted down and slaughtered by the ZKDS…and the AKP and FG aren’t too friendly either. Such people have learned to be extremely kind, gentle, and careful. A shining example today is Alparsan Kuytul and his Furkan movement. Kuytul opposes the war on Syria, denounces takfiris (ISIS etc.) and their Saudi sponsors, and generally speaks truth to power, putting principle ahead of expediency. His movement represents the real future of Turkey, if it has one. So…OBVIOUSLY this this week’s coup attempt represented FG and ZKDS trying to overthrow the AKP. The question is, why – and why now? Bingo! But Greenhalgh doesn’t offer any framework for understanding the coup’s relation to that geopolitical game. 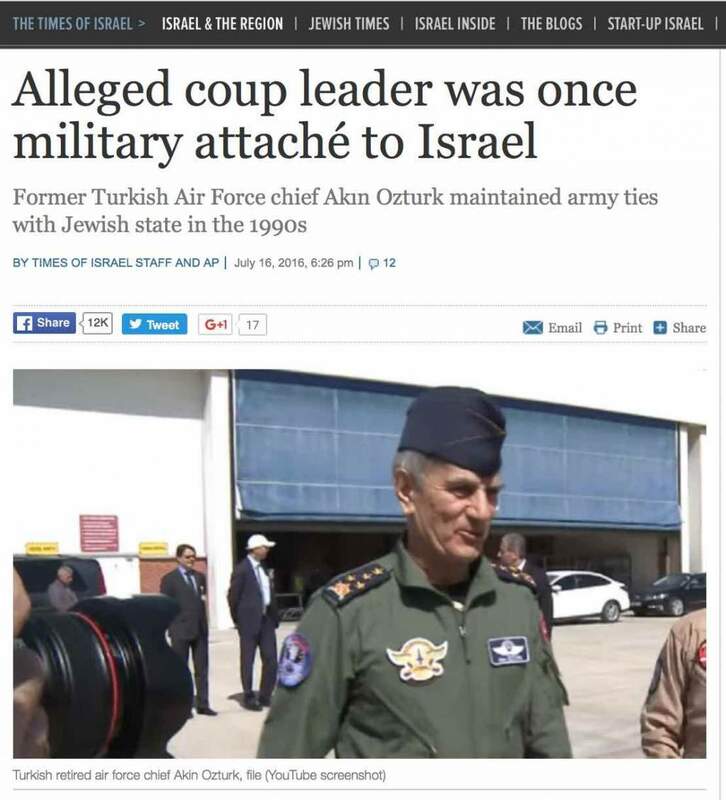 Let’s start with the observation that Israel’s top man in Turkey, Gen. Ozturk, tried to overthrow Turkish (Islamic) democracy, in exactly the way that Israel’s top man in Egypt, Gen. al-Sisi, overthrew Egyptian (Islamic) democracy. *First, as mentioned, even the corrupt, watered-down, compromising and compromised Islamic democracy of people like Erdogan and Morsi represents a long-term strategic threat to Israel. The top long-term strategic priority of the Zionists and their NATO lackeys is to prevent Sunni-majority countries from ever freeing themselves from imperial-Zionist control and becoming Iran-style Islamic democratic republics. People like Erdogan and Morsi threaten to nudge their countries, baby step by baby step, in that direction. The end game of all such activism is a neo-caliphate uniting many contiguous Muslim-majority countries—presumably a “caliphate” that mixes theocracy with democracy, as in Iran’s Islamic Republic. Such empowerment of Middle Eastern Muslims would quickly put Israel out of business. *Second, just as Zionist Empire overthrew Saddam and Qaddafi not for their very real crimes against humanity but for their good actions (their empowerment of their own people), the Zionists also want to overthrow Erdogan not because he foolishly let himself be led by the nose into the Syrian quagmire, but because he is threatening to extract himself from that quagmire and repair ties with Iran and Russia. For details, see the Crescent-Online article “Desperate Turkey turns toward Iran” and note Erdogan’s recent move toward rapprochement with Russia. Israel wants to keep the Syria conflict going. Erdogan may be about to help end it. As for Greenhalgh’s defacing, I mean prefacing, my article with a lot of incoherent gibberish, I will attempt to parse and answer the questions not answered above. Greenhalgh: “The Caliphate that Kevin talks about reminds us of the Oded Yinon plan to create a Greater Israel.” This is beyond nonsensical. The Caliphate is an institution that is just as central to Sunni Islam (and Shia Islam, but with a different interpretation) as the Papacy and the Church of Rome are central to Catholicism. The Caliphate has existed, in various imperfect forms, since 632 a.d. The vast majority of the world’s Muslims want it officially re-established, just as the vast majority of Catholics would want the Papacy and the Church of Rome re-established if those institutions had been destroyed by enemies of Christianity. A neo-caliphate is strongly desired by the people of the Muslim-majority countries. Therefore there can be no real democracy in that part of the world without one. Greater Israel, on the contrary, is strongly opposed by virtually everyone in the Middle East. So is Lesser Israel, for that matter. So democracy in that region requires the termination of these genocidal, apartheid projects. Let’s end with a couple of questions for Ian Greenhalgh. *Ian, do you agree that peoples have the right to self-determination? Please answer yes or no. *If your answer is yes, how can you oppose a caliphate (i.e. a political union of Muslim-majority territories) that is ardently desired by the people in question? *And if you oppose this project, over the objections of the people concerned, do you support the continued use of lies and violence to prevent it from coming to fruition? *Finally, do you agree with my analysis that the coup forces in Turkey are, to say the least, even more accommodating of the Zionists than Erdogan and his AKP? Yes or no? If your answer is no, what evidence can you cite? I would be happy to discuss this with you on my radio show. Please contact me at TruthJihad(at)gmail[dot]com and we will set up an interview ASAP.